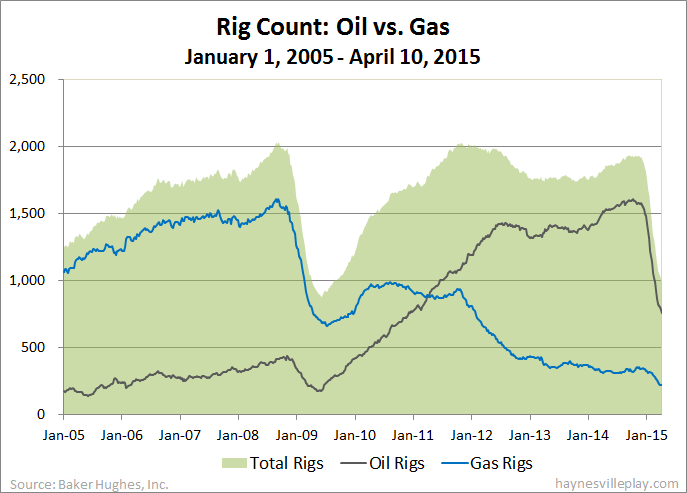 The Baker Hughes U.S. rig count was down 40 this week to 988. Oil rigs were down 42 to 760, gas rigs were up three to 225 and miscellaneous rigs were down one to three. By type, horizontal rigs were down 29 to 770, vertical rigs were down eight to 128 and directional rigs were down three to 90. This is the first week gas rigs have increased since January 30, an eleven week period during which gas rigs have dropped by 97. Among gas rigs, horizontal rigs were up one to 180, directional rigs were unchanged at 34 and vertical rigs were up two to 11.